If you’ve just finished installing hardwood floors, or are in the market, you should know that hardwood floor may change color. Sunlight affects each wood species differently, but most will darken over time until it’s fully seasoned. This post will focus on how sunlight will affect your floor so you can make in informed choice. Sunlight contains Ultraviolet type A and type B rays (UVA & UVB). These rays can bounce off water, sand, and even penetrate glass. Many people know that UV light can cause skin cancer, but it can also change the color of furniture, carpets, hardwood flooring and artwork. In short, UV light can cause your furnishings to take on a prematurely aged look. UV light causes wood to change color, especially exotic species. Depending on your type of wood, UV exposure may lighten or darken your flooring, but most tend to darken. 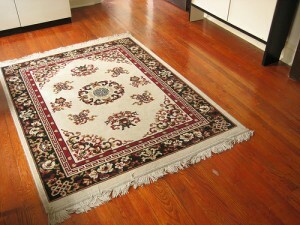 The effects are very evident where area rugs or furniture cause an uneven change in color. Typically, color changes occur more rapidly at first and are indistinguishable after 3 – 6 months (depends somewhat on exposure). It’s tough to find the effects of UV light on specific wood species. I’d encourage readers to comment with their own experience. Cedar – sunlight bleaches out unfinished cedar floors and causes them to darken after a finish is applied. Brazilian Cherry – darken relatively quickly. American Cherry – darkens to a deep red. Teak – turns darker brown. Yellow / Red Oak – slightly lighter over time. Maple – lighten over time. Brazilian Walnut – darkens causing a more uniform look. American Walnut – lightens over time (nathalie comment). Brazilian Ash – little change over time. Purpleheart – turns more of a brown. One way to counteract UV rays is to block them. If you prevent them from entering your home, they can’t damage your hardwood floors. New windows have lots of innovative features like double and triple pane glass, inert gas insulation, and non-conductive window frames. UV blocking films are an important feature you should consider when replacing your windows. These films can also be installed on pre-existing windows. You can opt to have a professional install them, or tackle the project yourself. Either way, UV films not only protect you and your family, but they also protect your home and furnishings by blocking up to 99% of these rays. What do you think? Has your floor changed color? Do you have a UV coating on your windows? Tigerwood – THE fastest changing most UV sensitive of species… try a fun experiment place asticky note on a board.. put it in direct sunlight for a few hours and you will be amazed! darkens up a lot! I put hard wood floors on the family room three weeks ago. Now I did the kitchen. The hardwood floor in the kitchen is ligther than the wood floor in the family room. We use the same producto for both floors. The contracto told me that the wood floor in the kitche will dark in three weeks. This is true? When the family room floor was done it was on one color and did not change. @Evelyn, What species of wood did you put down? When installing hardwoods you’ll get some differences even between boxes. That’s why it’s important to open several boxes rather than working through one at a time. We have brazilian cherry floors and used area rugs because of our dog. Now we have lighter areas where the rugs are. What can we do to even out the color? If we remove the rugs, how long will it take for the color to darken since it’s October now and there isn’t as much light? We don’t want to go to the expense of refinishing the floors. It is light a sunburn or tan. The lighter areas will cTch up. I’ve heard of cherry changing colors, but didn’t realize oak would. So far we’ve not noticed any changes in the eight years since our floors were laid. Are the UV rays harmful during the winter months? Can you use special lights to even the color after a rug is removed?